When you’re a true music lover, you shouldn’t have to settle for lackluster sound just because you’re on the go. Upgrading to the aLLreLi Bass Stereo Wireless Over Ear Headphone will allow you to hear every song the way the artist intended for a listening experience that’s more like a concert in your ear. The aLLreLi Bass Stereo Wireless Over Ear Headphone combines enhanced bass with APTX audio technology to make music richer. Songs sound balanced with throbbing bass and distinct highs with no distortion. Enhanced noise cancellation technology minimizes background sounds, so that you can focus on the music even when you’re in a crowded place like an airplane, the gym or a bus. With the aLLreLi Bass Stereo Wireless Over Ear Headphone, you get the freedom to connect two different ways. You can use our headphones as a BlueTooth headset, pairing them with any BlueTooth smartphone, tablet, laptop or music player for wireless listening. In addition, this audio accessory is a wireless wired headphone that can be connected with a 3.5mm audio cable. 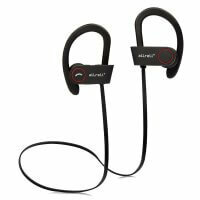 Powered by a rechargeable lithium ion battery, the aLLreLi Bass Stereo Wireless Over Ear Headphone can provide 2 to 3 hours of listening enjoyment before requiring a recharge. A built-in microphone and on-board controls allow you to answer calls from your smartphone, change songs and adjust the volume without having to reach for your mobile device when you’re using the headphones as a BlueTooth headset. Get a better listening experience with stronger bass and more distinct highs and lows. Choose the best wireless wired headphone on Amazon. Order the aLLreLi Bass Stereo Wireless Over Ear Headphone today.